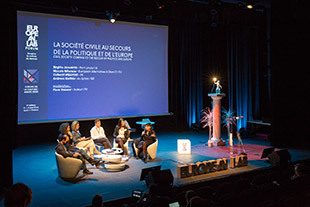 At the last edition of the European Lab Forum, held in Lyon in May 2016, we dissected and discussed a series of alarming social, territorial and generational divides that were fast becoming chasms. These divisions were already relentlessly fuelling society’s compulsive and hysterical rejection of a “system” – denounced by all, even if nobody could de ne it –, of the real or imagined elite, of radicalism, of propaganda and of digital conspiracies. Since then, such trends have only been reinforced by a series of unexpected political developments. In a matter of months, the United Kingdom voted to leave the European Union, Donald Trumpwas elected President of the United States, and Turkey intensi ed its progressive dri towards authoritarianism under President Erdogan. Meanwhile, Vladimir Putin tightened his vice-like grip over Russia, once more proving to incredulous observers and citizens his endless capacity for nuisance-making, which apparently now extends as far as malicious intrusions into the democratic mechanics of other western countries. by nationalist-populist onslaughts, generalised xenophobia and digital intoxication. From Austria to the Netherlands, not to mention the upcoming elections in France and Germany, time and again Europe is forced into performing democratic acrobatics to avoid falling into the malicious traps that have been set in its path. But how long can the continent keep playing Russian roulette with democracy ? The early years of the twenty- rst century are defying even the most negative of predictions concerning the obliteration of our democratic and humanist values. We have been left with an overriding nausea akin to falling down a bottomless abyss or witnessing the never-ending, slow motion car crash of democracy. The natural outcome has been the onset of a profound, violent and unprecedented sense of despair. In response to this global unravelling of democracy, an even more dangerous and internalised malaise is starting to take hold within both individuals and societies: fragmentation, growing individualism, the disintegration of relationships, and the dilution of our sense of community. Fatalism and surrender are undermining our drive to build a better world together. As individuals, facilitated by online algorithms and social networks, we are increasingly prepared to disregard collective interests in favour of the comfort of our own micro-communities. But can a crisis, or a transition, really be never- ending ? “The crisis consists precisely in the fact that the old is dying and the new cannot be born ; in this interregnum a great variety of morbid symptoms appear.” The ingredient of the ‘interregnum’ in this famous quote from Antonio Gramsci leaves a particularly bitter taste in the mouth, when considered in light of recent events. Are we capable of pushing beyond this seemingly endless period of transition? How can we join forces once more to trace out a shared horizon, to formulate a democratic desire or a new collective adventure far removed from the multi-faceted crisis that is blighting our age and our world? Deprived of optimism, of utopia, of enthusiasm for what is still to come and of a sense of shared global adventure, the generations to have emerged since the fall of the Berlin Wall – the so- called ‘Hangover Generation’ – have already paid a heavy price. Resentful of not feeling responsible for the world that they inherited, these young people are now suffering the frustration of being unable to take the future back into their own hands. The spirit of the European Lab Forum, now more than ever, is all about pushing beyond this phase of bitterness, fatalism and passive observation, and giving a platform to those who are prepared to take action: a young generation of activists, artists, researchers, academics, project leaders, entrepreneurs, journalists and authors from Europe and beyond. This new multi-national movement of activists, increasingly engaged and less and less marginalised, have got what it takes to wrest back control, precisely because theirs is a community that was formed in a world shaped by disenchantment. European, digital and crisis natives, theirs is a path towards independence and alternatives: this relentlessly engaged community has emerged from the shadows of state institutions, closer to the terrain where social wounds are at their rawest, and with very few resources at their disposal. At the micro-local, European and international levels, these citizen reconstruction activists are now increasingly joining forces, bound together through creation, culture, social and democratic innovation and the spirit of entrepreneurship and imagination, shaped by an underlying sense of the common good and the shared will to rede ne our future. This is the community that is flying the flag in the ongoing fight against identity mirages and reinvented pasts. That is standing up for solidarity and redefining the parameters of public values, of respect for collective interests and the common good. That wishes to reinvent tomorrow’s media, their economic models and their independence, in order to reaffirm the value of a moral code, of ethical journalism, of respect for privacy, of a taste for adversity, of investigative spirit and of the drive to deconstruct false information. That rises up against new forms of propaganda in this post-truth era, by leading the online fight to reconstruct a truly democratic digital space and to expose instruments of conspiracy and fake news. That dares to imagine a big data policy that is both democratic and in the public interest. And last but not least, this is the community that wishes to transform Europe by reviving its old aspiration to become the Promised Land for new social and entrepreneurial ambition, for cultural innovation and for freedom. These initiatives and movements can, and must, serve as the bedrock of our desire for a democratic reinvention. It is up to us to move on from the era of passive observation, inward-looking individualism and surrender, and to march forwards towards a new phase of construction, collective adventure and democratic revival.